Over the week-end, we told you that an Android-based Nokia 8 could be released in the near future. Now, we have what seem to be the first legit renders showing the Nokia 8 in all its glory. Revealed by Venture Beat, the renders allegedly present the front and back of the Nokia 8. Obviously, this is a handset that doesn't stray too much from the design of HMD's current line-up of smartphones (Nokia 6, Nokia 5, and Nokia 3). The yet-to-be-announced Nokia 8 has pretty thin bezels on the right and left side of its screen, but the top and bottom bezels are certainly on the thick side. There's a fingerprint scanner on the bottom bezel, flanked by capacitive navigation keys. On the back, the smartphone seemingly has a Zeiss-branded 13 MP dual camera - just as expected. Unlike the Nokia Android phones that are currently available to buy, the Nokia 8 is a high-end device - a flagship. Its highlight features (besides the dual Zeiss camera) reportedly include a Qualcomm Snapdragon 835 processor, a 1440 x 2560 pixels display (possibly measuring 5.3 inches), up to 6 GB of RAM, and 64 GB of internal memory. The Nokia 8 likely runs near-stock Android 7.1 Nougat, and might be announced in about two weeks' time, on July 31. It's said that the handset will cost under €600, which means it could cost under $600 in the US. Unfortunately, for now, we don't really know if the Nokia 8 will be officially released in North America. Nevertheless, we'll bring more information about the phone as soon as we have it. What do do you say, does the Nokia 8 look like a device ready to compete with all the other flagship smartphones of 2017? This is certainly DOA.. To think i've waiting for this? LMAO! I am sure it's not a strong as s7 active. They will kill everything with $600 price tag. Apple and samsung will be running for their money. No they didn't. They kept the bezels because thier design chief got passed by the market. 3/4" bezels don't save phones. The S8 Active will expose that. not gonna be a huge hit, at least not in the US, I can guarantee that. Yeah, the design is really..."meh." What happened to this beauty? 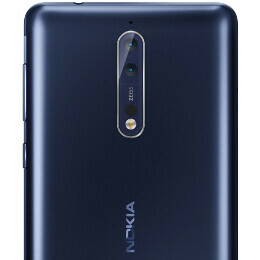 ?https://www.phonearena.com/news/If-the-Nokia-9-looks-as-good-as-this-concept-well-all-be-Finnish-for-a-day_id93112 Hope we still see something like this from Nokia/HMD. They call this high end? It looks like any midrange out of China. Why would anyone not get the cheaper nokia 6 instead? Many reasons: the Snapdragon 430, the Snapdragon 430, and the Snapdragon 430. Shh, we don't want to hurt "her" feelings with the obvious truth. Nokia is keeping their design the same across all price range like Motorola, so this was to be expected. Probably a better deal than the OP5. Nokia is dead along with the other OEMs from the prehistoric days like blackberry, palm, and windows mobile. I think that you underestimate Nokia's fanbase. I have a feeling that this one is going to sell good at least. I can tell since I see someone below throwing a hissy fit yet again. I think you're right because one has been selling on Amazon. Lmao! Now you're backtracking because you got embarrassed becaue he put you in your place. Not backtracking at all. Stop projecting. Yea you are. Stop lying. Lmao! I called it. You now troll Nokia articles because I speak favorably about them. You're so predictable. What do you expect from someone who has no shame in showing his obsession with you and DJ? Lol, exactly. He's predictable and pathetic. Someone needs to explain that to Tondern comment #34. He clearly doesn't know what he's talking about. This is a bs response. Yes, your response is a BS response. Glad you admitted it. Apparently you are the one who is obsessed, majerk. This is coming from the guy who continues to get screwed by Samsung. I don't post here on PA quite enough to know the reply-wars on here but I think you overestimate your own importance and impact on other people.